DJI, the world leader of consumer and pro level drone technology, has released two new drones onto the public: Phantom 4 Pro and Inspire 2. Both of the drones are opening a new page in the drone technology and Aerial Imaging, but which one is better? 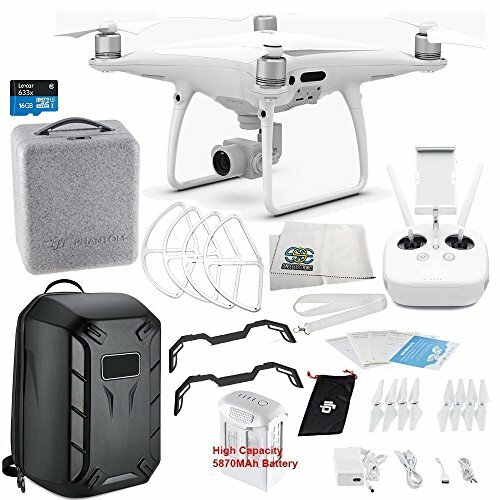 The Phantom 4 Pro features an uprated camera equipped with a 1″ 20MP sensor capable of recording 4K video at 60 frames per second and it is more for the professional drone whose flying camera has higher requirements than just for casual shooting. The Inspire 2 is more technologically advanced and fully featured drone and it is a pro level flying robot oriented for the high-end film creators. The brand new DJI Inspire 2 is a powerful cinematic and photographic tool. This drone is not only lightweight but also very stiff because its body is made of magnesium aluminium and carbon. The DJI Inspire 2 looks very similar to its previous model, but several key upgrades were made on the new model to make it more efficient and ensure it handles better. The Inspire 2 can be used with brand new X4S and X5S cameras. You can get stunning shots in different directions because the new front facing camera allows pilot to focus on the flight while the pilot is using a main camera. It is important to note that this drone will support other cameras in future. Inspire 2 features new image processing called CineCore 2.0. This image processing allows it to process large files faster than ever before. It captures 5.2K video at 4.2 Gbps in RAW, for a sophistic and technologically advanced video streaming experience unlike any other. The DJI Inspire 2 also has an SD slot so you can store videos straight to the new, redesigned CineSSD. This drone is also capable of streaming 1080p video at 50fps and 720p at 60fps. The DJI Inspire 2 comes with a dual battery system. This feature is very useful because it ensures that if the first battery fails while it is in flight, the drone won’t drop to the ground. The dual battery system allows the drone to stay in the air for a whopping 27 minutes. Another new improvement is a self-heating battery, which ensures that the drone can be used safely in the extreme low temperature up to -20 degrees Celsius. The Inspire 2 can fly at a blistering 67 miles per hour and it takes only 5 seconds to reach 50 miles per hour. This means it’s faster than about any city traffic other than taxi cabs. The drone can fly at the heights of 5000m (16,400 ft) above the sea level with special high-altitude propellers, which means that Inspire 2 can be used in variety of scenarios where other drones can’t get the job done. Thanks to these amazing features, the Inspire 2 can follow fast-moving subjects for dramatic sports and action footage. Zenmuse X4S is a new camera for the Inspire 2. It has a 1 inch 20 MP sensor and almost 12 stops of dynamic range. X5S features Micro 4/3 20.8MP sensor. It also has ability to fit up to 10 different lenses on it including wide angles and zoom lenses. You can easily swap out the lenses on the Inspire 2. You may want to change out the lenses for different times of day to get just the right shot every time. DJI Inspire 2 actually comes with two cameras. The first one is the cinematography camera. This camera allows you to take expansive views of the drone’s surroundings and those are the shots you’re going for with a drone flying up in the sky. The smaller, first person camera mounted on the drone’s front allows you to look out where you are going and this camera can be independently controlled and its video feed shows up independently in on the controller’s screen. Advanced obstacle avoidance is also updated on the Inspire 2. It is built into DJI’s FlightAutonomy system and implemented by dual front cameras facing both downwards and upwards with infrared sensors dedicated for a safe flight in enclosed area. Forward and downward vision systems enable the Inspire 2 to detect obstacles up to 30 meters ahead. This feature allows for protected flight at up to 34 mph at a controllable attitude angle of 25°. You may not use those top sensors very often. However, you’ll be glad you have them if you are flying it indoors to keep you from hitting the ceiling. Inspire 2 can also create a real-time map of its flight route as it flies using forward and downward vision systems. This feature is extremely useful because it allows the drone to fly home along its original route and change to a straight line when it regains a signal if the video transmission system signal is lost and Smart Return Home is enabled. The drone will use the primary camera to identify obstacles as far as 200m in front as it returns. This allows it to plan a safe route home. Its double battery system ensures that even if a problem occurs on one battery, the other is able to continue flight long enough for a safe landing. Completely redesigned the Inspire 2 propulsion system can thrust the Inspire 2 up to 58 mph and gives the drone an ability to descend at the speed of 30ft/s (10 m/s) and climb up at about 20ft/second (7m/s). The slave and master controller range now extends to 328 feet (100 meters). It also has the option to choose between 2.4 GHz and 5.8 GHz frequencies to avoid interference for greater signal stability. 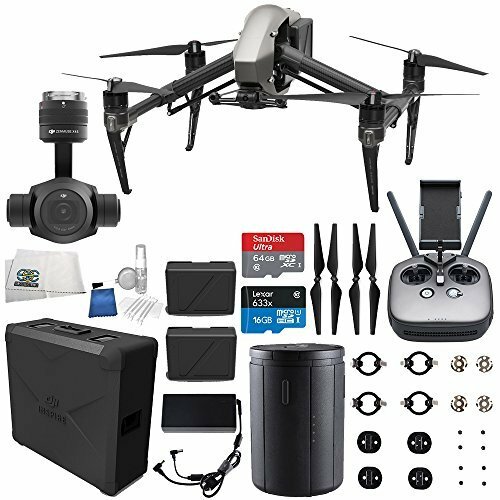 DJI is known as a company that always offers a bunch of different accessories for their drones and Inspire 2 is not an exception. You will be able to use the DJI Focus, a battery charging station, DJI CINESSD, CINESSD station with Inspire 2. Also, other optional accessories are available, such as an all-new transmitter controller, extra propellers, a calibration plate, and a carrying case to store and transport everything. Another bonus is the optional monitor called DJI Crystalsky, which comes in 5.5-inch and 7.85-inch sizes. Its dedicated system reduces video transmission latency and it also comes with the highest brightness up to 1000 cd/m2 and 2000 cd/m2 respectively. $5,000 DJI Inspire 2 vs Phantom 4 Pro & Mavic: Worth It? DJI upgraded Phantom 4’s camera to a professional level and now Phantom 4 Pro features a 3-axis-stabilized gimbal camera with a 20MP, 1″ CMOS sensor capable of shooting up to 4K/60fps video and well as photo bursts at up to 14 fps. This camera is a huge upgrade in comparison with the previous model. Phantom 4 Pro also offers H.265 video compression, which substantially improves video quality at the same bitrate and there’s also an SD slot on the camera so that you can record and transfer videos you have recorded. DJI hasn’t changed the design of the remote control for few years and the design of the RC remains the same outside. However, the good news is that the change comes from within the controller and it comes with a built in GPS for precise RTH, HDMI and a micro SD card slot for the video backup. It also offers a 5.8 GHz channel for the Lightbridge link, in addition to 2.4 GHz to get the best channel clean from interference. The biggest update is the built in screen on Phantom 4 Pro, which is brighter and better connected than it has ever been. It is important to note that the screen can be clearly seen even under the straight sunlight. Phantom 4 Pro has dual sensors in front and on the back of the drone as well as the infrared sensors on a sides and it is considered one of the safest drones to fly these days. You won’t have to worry about hitting much of anything if you fly in the obstacle avoidance mode because the technology builds a 3D model of the environment it’s flying in in real time. The end result is wherever the Phantom 4 Pro flies the sensors will do a lot of the work for you, automatically steering it out of harm’s way and protecting your drone. The sensors range of the 3D obstacle avoidance is around 30 meters (98 feet). This is more than enough for the fast moving aircraft. It is important to note that you will not be able to engage the Obstacle Avoidance system if you are flying in Sports mode. The new battery design will be more than efficient than on the previous model and the Phantom 4 Pro features a maximum flight time of 30 minutes. This is very important because professional aerial imaging benefits from longer flight times. The DJI GO app shows battery lifetime and calculates remaining flight times according to distance travelled and it will give alerts when it reaches a minimum safe amount required for a safe journey back to the takeoff point. Some amazing intelligent flight modes have been added to Phantom 4 Pro. It can be very challenging to follow fast-moving objects. However, the Phantom 4 Pro uses advanced, image-recognition algorithms that allow it to recognize and track an object while keeping it in frame. These algorithms also recognize a range of subjects, from people to animals and vehicles and they will ensure perfect shots by adjusting its flight dynamics to match. Trace: the drone follows behind or in front of a subject and avoids obstacles automatically. Profile: the drone flies alongside a subject at a variety of angles to get profile shots of the subject. Spotlight: this mode keeps the camera trained on a subject while the drone flies almost anywhere. Standard: The drone follows the route at a constant speed. In this mode, the camera is facing in the direction of flight. Free: The drone only moves along the route when instructed and the camera can face in any direction during a flight. Computer vision technology allows the Phantom 4 Pro to take instructions through gestures and with this mode selfies can be captured using a few gestures without the remote controller. The Phantom 4 Pro records its route as it flies and it can automatically choose the best route to return home depending on environmental conditions. This mode allows the drone to return along the same route avoiding obstacles if the control signal is disconnected. This feature works for up to 300 meters (984 feet). The Phantom 4 Pro offers three modes for flight: Position Mode (P), Sport Mode (S) and Attitude Mode (A). Different productions require different flight characteristics and switching between these flight modes allows pilots to get the control they need, whether they seek speed, smoothness, intelligent navigation, or simplicity. Attitude Mode (A) switches off satellite stabilization and holds the drone’s altitude, which is ideal for experienced pilots looking to capture smoother footage. Sport Mode (S) adds extra agility and higher speed. In this mode the Phantom 4 Pro reaches 45 mph (72 kph). In Position Mode (P), ActiveTrack, obstacle sensing, TapFly and positioning features are available. Tripod Mode provides precision control for fine framing and indoor flying. However, it limits speed to 4 mph (6 kph). DJI Phantom 4 Pro/Pro+ & Inspire 2 Preview: Best Drones Ever?! DJI announced two new drones today, the DJI Phantom 4 Pro/Pro+ and the Inspire 2. I preview both drones and ask if they are the best drones ever. There are a lot of similarities between these two drones and you can’t go wrong with either one of these. They both have some great features but for many people, there’s not going to be enough extra stuff on the DJI Inspire 2 to warrant paying double the price of the Phantom 4 Pro. The Inspire 2 certainly has more going for it and the faster acceleration, the addition of the first person camera, the extra SD slot and other cool features make it a stand out drone and one of the best on the market. On the other hand the Phantom 4 Pro is going to seem like the more appealing choice if you are working with a budget. It’s cutting edge and not some cheap drone that will only last you for a short while before you need to replace it. Obviously it has some substantial downgrades from the Inspire 2. The DJI Inspire 2 is definitely the better drone. However, its price is going to turn away a lot of buyers who aren’t prepared to shell out that much money for a drone.